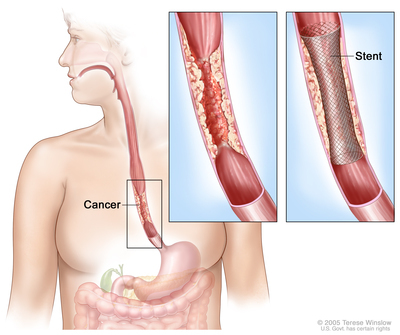 There are different types of treatment for patients with esophageal cancer. 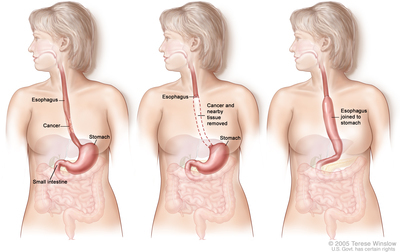 Different types of treatment are available for patients with esophageal cancer. Some treatments are standard (the currently used treatment), and some are being tested in clinical trials. A treatment clinical trial is a research study meant to help improve current treatments or obtain information on new treatments for patients with cancer. When clinical trials show that a new treatment is better than the standard treatment, the new treatment may become the standard treatment. Patients may want to think about taking part in a clinical trial. Some clinical trials are open only to patients who have not started treatment. Patients have special nutritional needs during treatment for esophageal cancer. Many people with esophageal cancer find it hard to eat because they have trouble swallowing. The esophagus may be narrowed by the tumor or as a side effect of treatment. Some patients may receive nutrients directly into a vein. Others may need a feeding tube (a flexible plastic tube that is passed through the nose or mouth into the stomach) until they are able to eat on their own. Surgery is the most common treatment for cancer of the esophagus. Part of the esophagus may be removed in an operation called an esophagectomy. The doctor will connect the remaining healthy part of the esophagus to the stomach so the patient can still swallow. A plastic tube or part of the intestine may be used to make the connection. Lymph nodes near the esophagus may also be removed and viewed under a microscope to see if they contain cancer. If the esophagus is partly blocked by the tumor, an expandable metal stent (tube) may be placed inside the esophagus to help keep it open. Small, early-stage cancer and high-grade dysplasia of the esophagus may be removed by endoscopic resection. An endoscope (a thin, tube-like instrument with a light and a lens for viewing) is inserted through a small incision (cut) in the skin or through an opening in the body, such as the mouth. A tool attached to the endoscope is used to remove tissue. The way the radiation therapy is given depends on the type and stage of the cancer being treated. External and internal radiation therapy are used to treat esophageal cancer. A plastic tube may be inserted into the esophagus to keep it open during radiation therapy. This is called intraluminal intubation and dilation. Chemotherapy is a cancer treatment that uses drugs to stop the growth of cancer cells, either by killing the cells or by stopping them from dividing. When chemotherapy is taken by mouth or injected into a vein or muscle, the drugs enter the bloodstream and can reach cancer cells throughout the body (systemic chemotherapy). When chemotherapy is placed directly into the cerebrospinal fluid, an organ, or a body cavity such as the abdomen, the drugs mainly affect cancer cells in those areas (regional chemotherapy). The way the chemotherapy is given depends on the type and stage of the cancer being treated. See Drugs Approved for Esophageal Cancer for more information. Chemoradiation therapy combines chemotherapy and radiation therapy to increase the effects of both. Laser therapy is a cancer treatment that uses a laser beam (a narrow beam of intense light) to kill cancer cells. Electrocoagulation is the use of an electric current to kill cancer cells. Targeted therapy is a type of treatment that uses drugs or other substances to identify and attack specific cancer cells. Targeted therapies usually cause less harm to normal cells than chemotherapy or radiation therapy do. Monoclonal antibody therapy is a type of targeted therapy used in the treatment of esophageal cancer. Monoclonal antibody therapy uses antibodies made in the laboratory from a single type of immune system cell. These antibodies can identify substances on cancer cells or normal substances that may help cancer cells grow. The antibodies attach to the substances and kill the cancer cells, block their growth, or keep them from spreading. Monoclonal antibodies are given by infusion. They may be used alone or to carry drugs, toxins, or radioactive material directly to cancer cells. Trastuzumab is a monoclonal antibody being studied in esophageal cancer. It may be given to block the effect of the growth factor protein HER2, which sends growth signals to esophageal cancer cells. Treatment for esophageal cancer may cause side effects. This information is not intended to replace the advice of a doctor. Navigating Care disclaims any liability for the decisions you make based on this information. This information was sourced and adapted from Adapted from the National Cancer Institute's Physician Data Query (PDQ®) Cancer Information Summaries on www.cancer.gov. This information updated April 1, 2019.